The shared L1 instruction cache grew in size with Steamroller, although AMD isn’t telling us by how much. Bulldozer featured a 2-way 64KB L1 instruction cache, with each “core” using one of the ways. 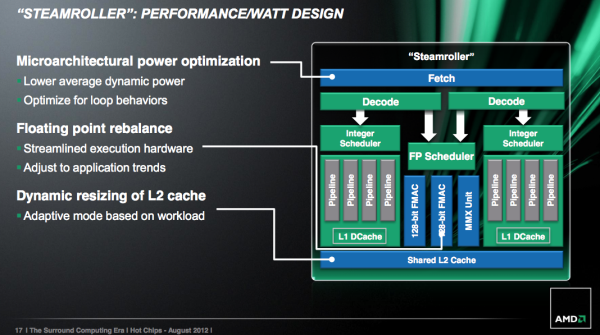 This approach gave Bulldozer less cache per core than previous designs, so the increase here makes a lot of sense. AMD claims the larger L1 can reduce i-cache misses by up to 30%. There’s no word on any possible impact to L1 d-cache sizes. Although AMD doesn’t like to call it a cache, Steamroller now features a decoded micro-op queue. As x86 instructions are decoded into micro-ops, the address and decoded op are both stored in this queue. Should a fetch come in for an address that appears in the queue, Steamroller’s front end will power down the decode hardware and simply service the fetch request out of the micro-op queue. This is similar in nature to Sandy Bridge’s decoded uop cache, however it is likely smaller. AMD wasn’t willing to disclose how many micro-ops could fit in the queue, other than to say that it’s big enough to get a decent hit rate. The L1 to L2 interface has also been improved. Some queues have grown and logic is improved. Finally on the caching front, Steamroller introduces a dynamically resizable L2 cache. Based on workload and hit rate in the cache, a Steamroller module can choose to resize its L2 cache (powering down the unused slices) in 1/4 intervals. AMD believes this is a huge power win for mobile client applications such as video decode (not so much for servers), where the CPU only has to wake up for short periods of time to run minor tasks that don’t have large L2 footprints. The L2 cache accounts for a large chunk of AMD’s core leakage, so shutting half or more of it down can definitely help with battery life. The resized cache is no faster (same access latency); it just consumes less power. Steamroller brings no significant reduction in L2/L3 cache latencies. According to AMD, they’ve isolated the reason for the unusually high L3 latency in the Bulldozer architecture, however fixing it isn’t a top priority. Given that most consumers (read: notebooks) will only see L3-less processors (e.g. Llano, Trinity), and many server workloads are less sensitive to latency, AMD’s stance makes sense. This one falls into the reasons-we-bought-ATI column: future AMD CPU architectures will employ higher levels of design automation and new high density cell libraries, both heavily influenced by AMD’s GPU group. Automated place and route is already commonplace in AMD CPU designs, but AMD is going even further with this approach. The power savings comes from not having to route clocks and signals as far, while the area savings are a result of the computer automated transistor placement/routing and higher density gate/logic libraries. The tradeoff is peak frequency. These heavily automated designs won’t be able to clock as high as the older hand drawn designs. 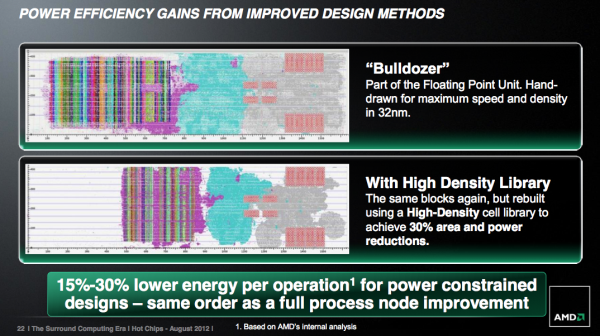 AMD believes the sacrifice is worth it however because in power constrained environments (e.g. a notebook) you won’t hit max frequency regardless, and you’ll instead see a 15 - 30% energy reduction per operation. AMD equates this with the power savings you’d get from a full process node improvement. We won’t see these new libraries and automated designs in Steamroller, but rather its successor in 2014: Excavator. Steamroller seems like a good evolutionary improvement to AMD’s Bulldozer and Piledriver architectures. While Piledriver focused more on improving power efficiency, Steamroller should make a bigger impact on performance. 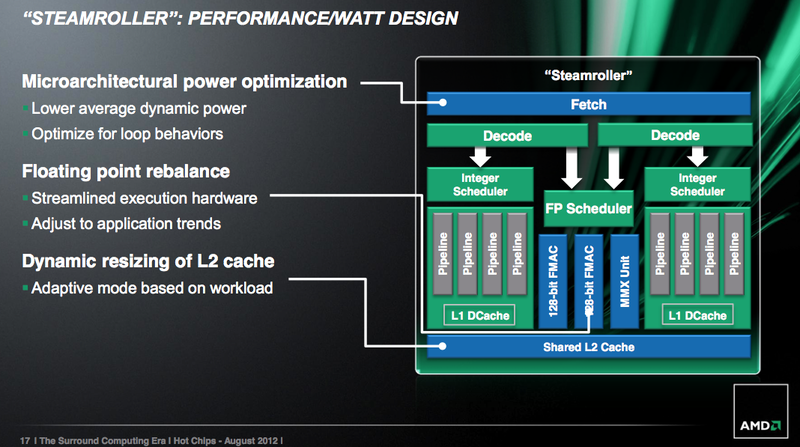 The architecture is still slated to debut in 2013 on GlobalFoundries' 28nm bulk process. The improvements look good on paper, but the real question remains whether or not Steamroller will be enough to go up against Haswell.